The responsible safari: Every trip to Africa is an experience of a lifetime. At Africa Safaris, we promise you that your safari to Africa will be a life changing opportunity, not only for the traveler but also for the people who live in the magnificent lands you visit. We have a great passion and respect for African cultures and wildlife, and believe that any safari lacking the basic principles of conservation and ecology will not give you a true picture of the experience that is truly Africa. It is a great privilege that we have the opportunity to visit and be part of these great lands & reserves, and in respect to this, it is important for us to do it responsibly. Africa Safaris is a supporter of several game parks and conservation facilities within Africa. Simply by booking a safari with us, our Safari Guests have contributed to the many regions they visit. How does Africa Safaris contribute to ecotourism? • Our Safari Partners are some of the industry’s highly respected conservation groups and establishments. • Our lodges are based on eco-friendly operations and most have been awarded for the role they have played in conserving their environment. • Our Safari Guides are passionate about their environment and enrich the safari guests’ experience by educating them on the local ecology. • Our Safari Guides are careful when conducting game drives, keeping in mind respect for the land and wildlife. • The funds used to pay for our safari accommodation, transportation and park entrance fees all significantly contribute to conservation of the land, cultures and wildlife. • Our Safari packs contain leaflets which enlighten Safari Guests on basic conservation & ecotourism ethics and encourage them to practice these tips throughout their safari to leave behind only the lightest footprints and take with them only their wonderful memories. • Through knowledge of these conservation ethics, our Safari Guests demonstrate how, with the right attitude, tourism could positively contribute to the local environment and cultures therefore promoting the importance of protecting the local wildlife. How else can a guest contribute during their safari? These are special eco-safaris created for travelers who would like to take a more serious role in conservation during their trip to Africa. 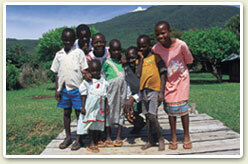 Please click here to learn more on these eco-safari travel programs in Africa. This is an ideal & fun way to help save the environment. Tree planting is a favorite activity amongst most Travelers as it leaves behind a special commemoration of your trip to Africa, which generations after you can visit and see. A special Tree-planting ceremony is conducted and often you get a certificate of thanks in return [varies from lodge]. Your name and address are also attached to the site where the tree was planted. A visit to this 200-acre Sanctuary and the 30-minute boat ride (subject to fine weather) on the river among the chimps is a special highlight of every visit to Sweetwater’s. The aim of the project, initiated by Lonrho East Africa, Kenya Wildlife Services and the Jane Goodall Institute, was to set up a colony where orphaned and abused chimps could be introduced, rehabilitated and taught to fend for themselves in an area similar to their natural living conditions. The Sanctuary currently has 24 chimps, including two babies born in the Sanctuary. An information centre near the chimps' enclosure gives you amazing insight into the chimpanzees - did you know that they have 98.6% of our genes? After walking through the vast information and chimp paraphernalia you leave the center with the feeling that you must do something to stop this tragic "chimp trade". And with the introduction of the Chimpanzee adoption program, you can. There is an adoption fee which provides you with an information pack on your special Chimp. This can be a special treat for visiting Rotarians! Rotary International is huge in Africa and has helped thousands of people across the continent to build their health and life. If you are an active Rotarian, why not meet with the local clubs and contribute to their projects? A complete list of the clubs in the areas you visit can be found on their International website.